The heating will be on for around 8-12 hours in one cycle a day when needed providing constant heat. Obviously it won't be needed during the summer months just like I haven't used my heating this year in my old house. I didn't think the screedboards would give much but I will need to check that out if that is the case. They are better conductors of heat than chip/ply which is why I had opted for them but if they're going to cause issues and given their price I might just look at alternatives. The house is going to be fully insulated throughout and at present only has 2 radiators in the whole house. The house is empty so taking up boards etc. isn't an issue. There was one in the hallway and one in the living room. Upstairs were electric storage heaters which have now been taken out. Can you safely tile over the 20mm screedboard? I'd be concerned about it flexing when people walk on it. If you google suspended floor underfloor heating systems you will find lots of proprietary methods of fitting ufh normally involving fitting a tray to support the pipes and I would recommend using one of these. I would be interested to know where you found someone recommending pouring screed over insulation wedged between joists, can you post a link? 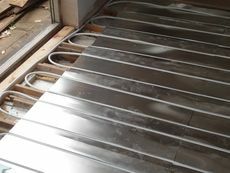 Any reason you're not opting to go for the metal heat spreader plates as opposed to the screed? This shows your method too, the screed between joists. Have to wait till next week for loads of questions. Really don't like the sound of what you are trying to do. 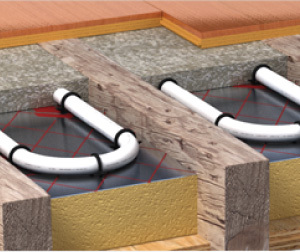 I am planning on installing Wet UFH in a house I am renovating and want it to be the main source of heating. There will be a radiator in the bathroom and one in the hallway potentially but that's it, I am hoping. The house is a 1920's semi detached property which needs some serious updating. It has a 32kw boiler and cavity wall insulation. I will be putting insulation in the loft as what is in there looks like it was put in by someone who was either blind or blind drunk (I have visions of someone spinning round quickly and letting go of the insulation at random intervals). I have been doing a quite a bit of research and have come up with the following as my idea. The house has 130mm joists so I am limited in what I can achieve within this. 25mm x 25mm battens running along the joist bottom. 80mm PIR Insulation laid on top of the battens. 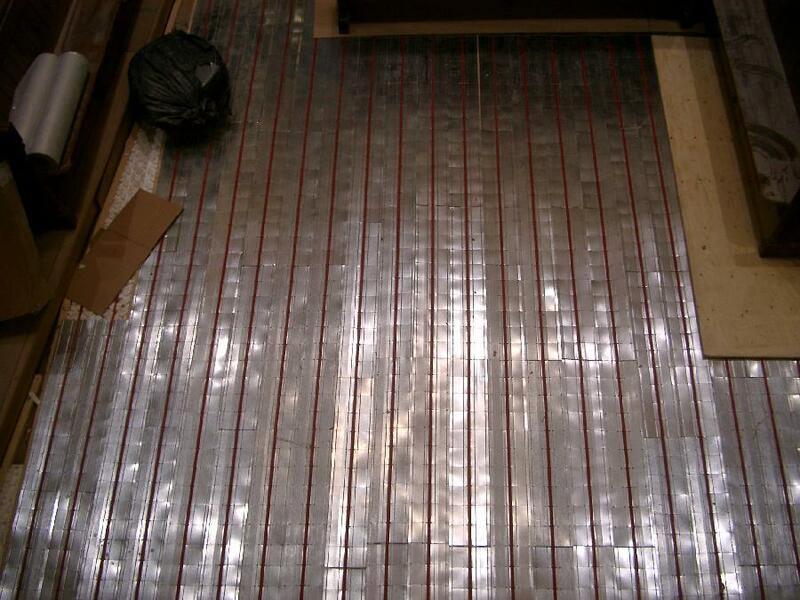 25mm flowing screed incorporating the 16 or 20mm UFH pipes throughout the house. This will make use of the 130mm joist space. 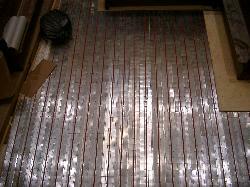 9mm tiles on top of these (tiles are suitable for UFH). I have a few questions initially about it before I take my plan any further but more will follow as I get into it, no doubt. 1. 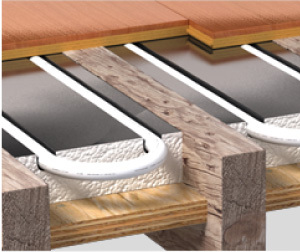 Will 80mm of thermal insulation supported by 25mm battens along the bottom of the joists be supportive enough for 25mm of flowing screed on top. It will be poured purely between the joists which are about 350-370mm apart on the ground floor of the house and 130mm deep each. The screed is thinner than is recommended but it will not take much, if any, load as the screedboards will do this on top of the joists. 2. Would 20mm piping make much more of a difference in heat terms compared to 16mm pipe. Both will fit within the 25mm of screed which I am planning to lay on top of the insulation. 3. Would I benefit much from using a bond to "fix" the screed to the screedboards or would this help encourage cracks/splits due to more movement in the screedboards that the screed lying on insulation by itself. 4. Would 20mm screedboard 9mm tiles (few mm for adhesive) and 25mm screed be sufficient to give a nice even heat across the floor without it being too cold or hot. 5. For best results in heat transmission upward should I ensure a complete layer of adhesive (as much as possible rather than notched) for the tiles so as to remove as much air between the adhesive and tile base as possible. I presume this will make getting them level much harder with a lot less "give" in the tile adhesive. I apologise if this should go in another forum area but wasn't sure which it should in covering numerous trades.